I picked the kids up at camp on Friday night and then spent the weekend with my cousin and her family out at their farm. The kids had a blast at camp and enjoyed the weekend with their cousins, but couldn’t wait to get home and see their dad. It is already 11pm and I have not yet posted for today, so I am trying to post about a previous project. Unfortunately, I don’t have any before shots, but I will try to explain. We moved into our home in July of 2008. The house was built in 1921 and was really in great condition, but needed some cosmetic work. Most of what we have done has been minor, with the exception of a complete bathroom reno. Our home is a one and a half story with 2 bedrooms on the upper floor and two on the main floor. Although the upstairs bedrooms are the largest, it made the best sense to put the kids upstairs and for us to have our master bedroom on the main floor. The second floor consists of 2 large bedrooms with walk-in closets, a good-sized sitting area at the top of the stairs, and a full bathroom. I believe the square footage on the second floor is around 700 square feet. When we moved in, we removed the 1970’s brown carpet and began to transform the space with paint. Despite the fact that we live in a heritage home, we knew that there was no hardwood flooring beneath the carpet. We decided to replace the ugly carpet with oriented strand board (particle board). This may sound completely crazy, but we had this in an upstairs of another home (a long story) and absolutely loved the look, value and durability. We bought cheap OSB (oriented strand board) and laid the 4 X 8 sheets on the entire second floor. My husband sanded them down to a beautiful blond colour and put on several coats of urethane. I absolutely love the textured look and we are not concerned about the wear and tear of the kids on the floors. My son even plays floor hockey in the oversized landing area! The entire second story floor was done for under $700 including wood, machine rentals, urethane, etc. and we love the look! The entire upstairs needed to be repainted and we proceeded to do so, with the exception of the bathroom. (It was not to my liking, but had been recently re-done.) My daughter’s bedroom is the largest at 15′ X 17.5′, with a large walk-in closet in the back corner of the room. She had lots of space, but the dark brown carpet and chocolate-brown walls just had to go!! I am so hooked on colour and paint. I truly believe that almost anything can be made to look a whole lot better with a coat of paint. Generally speaking, paint is a simple and inexpensive solution to any out dated space. 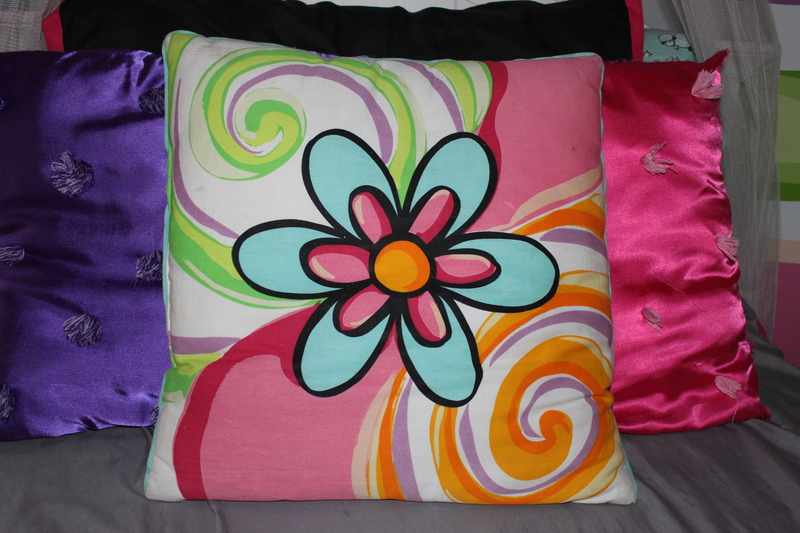 The inspiration for her room came from a cushion that was purchased a few years prior. I actually designed this room when she was 4 and had a similar design in our previous house. She is now 11 1/2 and still loves it. The greatest part is that some of the items are still from her original nursery, as it was done in the aqua tones that are still a part of her current colour pallet. The main colour for the room was taken from the flower on the cushion and applied to the walls using a colour wash. The aqua blue walls were painted using a translucent colour wash over white walls. Of course, the chocolate brown walls had to be primed and painted white in order to provide an appropriate base for this technique. You can see the door to the walk in closet to the left of the antique vanity. 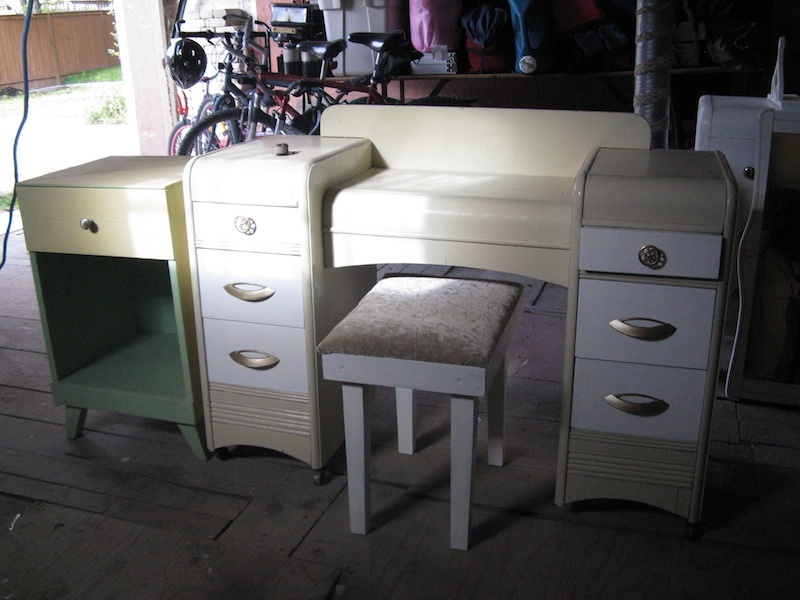 Here is a before shot of the antique vanity and bench. 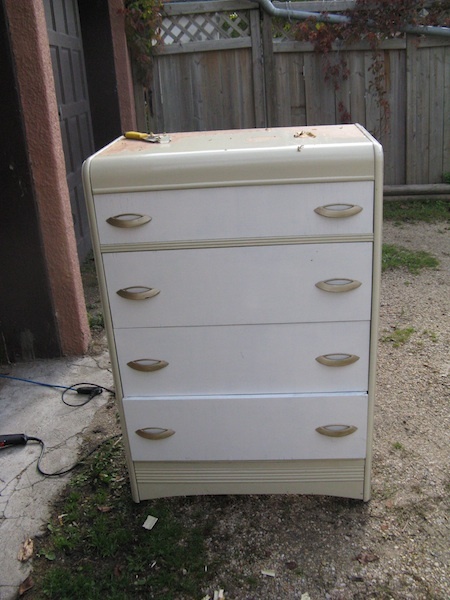 The dresser on the left was purchased with the vanity. Here is a before shot of the dresser. 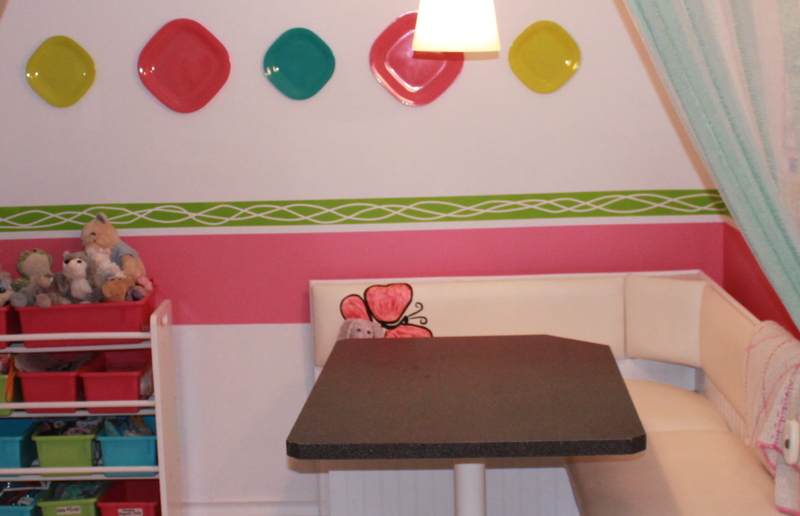 The stripes in the nook were created by applying 1/4″ painter’s tape over the white wall. The green was applied and then the tape removed to reveal the squiggly stripes created by the negative space of the white wall behind the stripe. 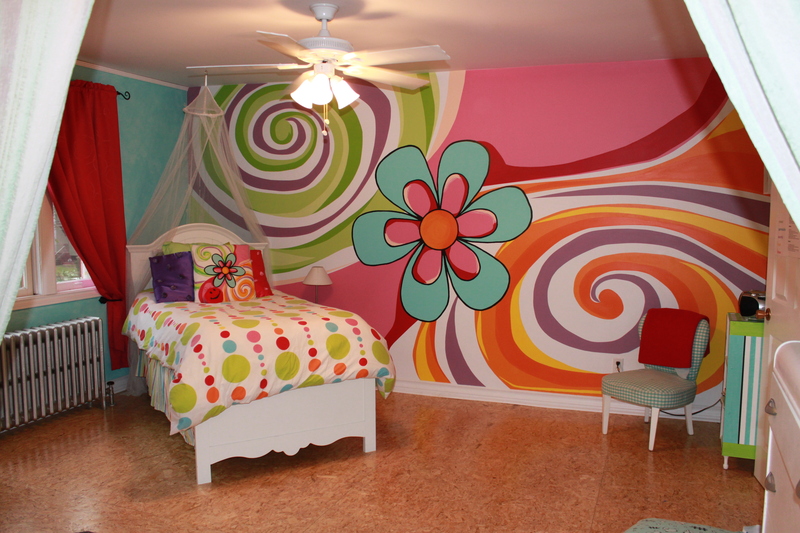 The throw pillow on Eden’s bed also became the inspiration for this hand painted mural on her bedroom wall. 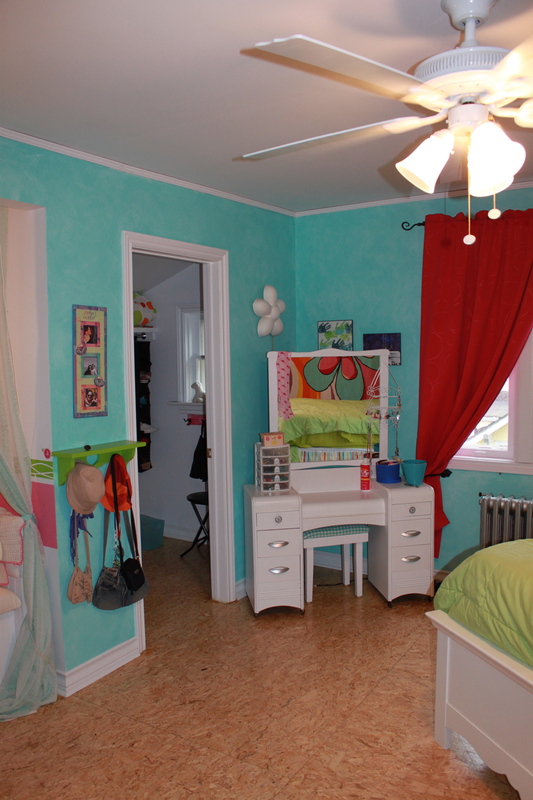 It incorporates all of the colours in her room and ties everything together. It was a huge project, but the style is one that has lasted from little girl to tween and she still loves it, so it was really worth the effort. (This is actually the second time I painted her this mural, as she had the same one in our previous home.) The little cabinet on the right is just a Walmart cheapy that was hand painted and designed to match her room. The chair next to it is the upholstered chair from her baby nursery. 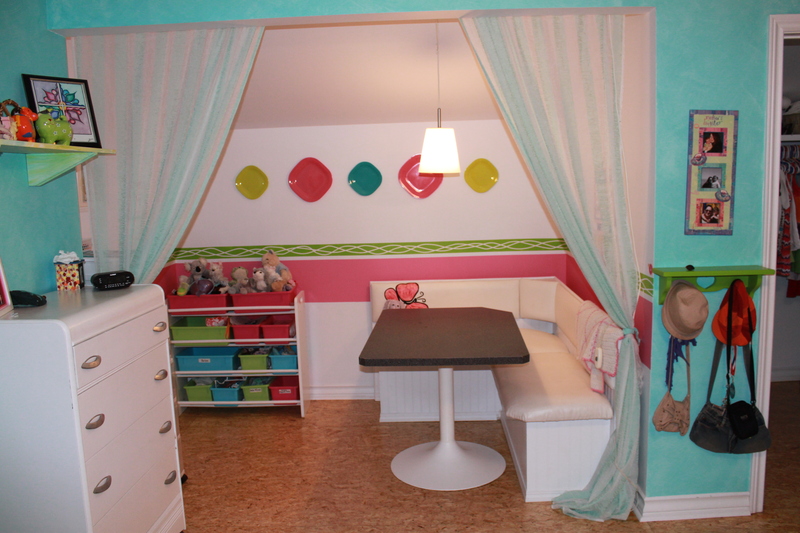 Posted on July 28, 2013 by Cindy Roy •	This entry was posted in Home Decor, Projects and tagged bedroom make-over, bedroom mural, DIY, girl's bedroom decor, girl's bedroom design, paint, tween bedroom, upcycling, wall mural for little girl. Bookmark the permalink.